If you thought gaming on a normal, 21:9 ultrawide monitor was ridiculous, wait until you get a load of a 32:9 superwide. Viotek’s SUW49C is a 49-inch curved “super” ultrawide display, capable of playing many games at 3840 by 1080 resolution. Too much? Just when I thought my Ikea office desk was long enough, along comes this monster. I’ve long been a fan of ultrawide monitors. Given a choice between a higher resolution, 4K display and a lower resolution ultrawide with a nice refresh rate, I’ll pick the ultrawide every time. I’d rather have more screen real estate without taxing my video card too terribly than try to push four times the pixels of standard HD. When Viotek offered me a chance to play with the even longer than ultrawide SUW49C, I jumped at the chance. The SUW49C is essentially two 1920 by 1080 monitors squished together. A lot of people use two monitors while working and playing. This is that, only without the bezels and with a pleasant, 1800R curve. It takes up a lot of desk space, being 47 inches across. Though it looks mighty imposing, it’s still smaller than two identical monitors would be. It’s not 4K, but it’s got all the other bells and whistles folks look for in a gaming monitor. It’s one of the first super ultrawide monitors to support HDR (high dynamic range), though the effect isn’t very pronounced. It boasts a 144hz refresh rate, though in order to achieve a 4ms response time, the lowest a VA panel can achieve, the refresh rate has to be dropped to 120hz in the monitor’s menu. It has Gameplus crosshair functionality, which means it can throw up a hardware crosshair (red dot, plus sign) on the display to help with aiming. Plus it comes with a remote, which is great for folks in massive electric wheelchairs who can’t reach the back of the monitor. Other games, like my beloved Final Fantasy XIV, look spectacular but might require some user interface tweaking before being playable. Considering the UI-heavy nature of massively multiplayer online role-playing games, once configured with the right mods, the extra screen space could be a godsend. For some, super ultrawide might be too wide. It’s a lot to take in and takes up a lot of space. Someone who likes to sit up close to their computer monitor might want to stay away, lest they risk neck strain from constantly turning their head. But me, I embrace this ridiculously long monitor. 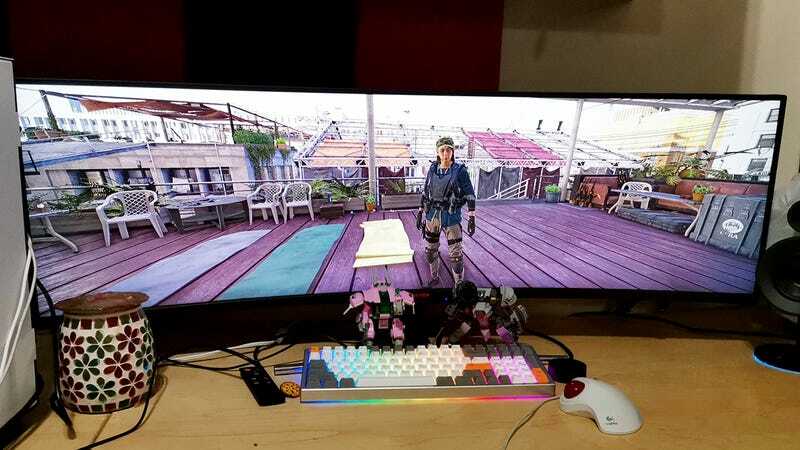 Super ultrawide is grand and glorious, and Viotek’s SUW49C is one of the most accessible, least expensive means of achieving it.